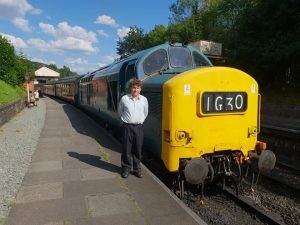 Thanks to all those who came along to support 6940 running over the 60’s weekend. Another 150 miles or so in the bag with the old girl soldiering on. One trip was completed to Friday 6th to support a wedding train as steam working was suspended and then 3 trip diagrams were completed for 60’s weekend each day. The weekend saw two new traincrew to our roster, me passing out as driver and George Walker as second man. Well done to George and thanks to everyone who has supported me over the 12 years I have been involved with the Group. 6940 continues to be rostered for all future running as our only loco in traffic. D5310 unfortunately appears to have sustained a failed No 2 traction motor bearing after developing bogie problems on 7th July. We need to conduct some more investigation work, but the nature of the damage to the commutator would suggest the armature has dropped onto the bottom set of brush gear. If this is indeed the case, the loco will require a lift, bogie strip and motor repair. We are looking at all options for this but if you can assist with technical advice, have a spare motor to sell or can assist with portable lifting jacks we would love to hear from you! We will be looking at 1566 in the next couple of weeks with the aim of trying to tighten the cylinder heads to see if that cures the leaks. If this is successful then the 47 may be back in traffic before the end of the season. 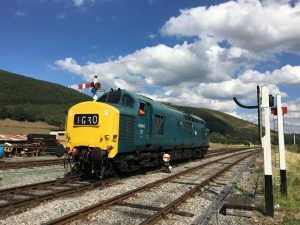 We are also looking for a visiting loco for our diesel weekend on 29th/30th September and our “Along Cambrian Lines” gala on 12th & 14th of October. 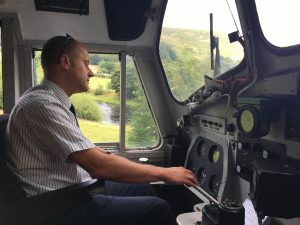 If you’re a loco owner or owning group member reading this and are interested please get in touch. We’ve got an amazing line to sample! Finally, here’s a photo of 6940 at Carrog on Sunday afternoon under the continuously blue sky we are becoming increasingly used to. Some rain would however be very much welcomed, with the wild fire on the Llantysilio mountain above the valley still flaring up after over two weeks of burning. Our thoughts are with the local fire crews who continue to work around the clock to keep it under control.